In 2004, the world’s first true outdoor television was launched, pushing the digital signage world in a new direction. Now, outdoor screens are becoming increasingly important in reaching audiences wherever they are. Driving the growing popularity of outdoor digital signage are technical advances that allow outdoor screens to be used in a wide variety of applications and the recognition that in many applications, today’s outdoor screens are more cost-effective than traditional signage. Today, digital signage has found wide appeal in the hospitality field. Bars, restaurants and hotels are enhancing their outdoor spaces with screens to provide both entertainment and information, including interactive menus, changing specials, directional information, event schedules and more. Outdoor attractions are also increasingly turning to digital signage. Parks, zoos, theme parks, outdoor festivals and more have found that digital signage provides the functionality of traditional signage, but with the flexibility to change messages as needed, whether it’s to provide maps, highlight a particular attraction, promotion or event, or even for use in emergency situations. It’s this ability to change messages when necessary, even program messages so that they change automatically, that makes digital signage a cost-effective option. But to withstand the rigors of the outdoors requires something far more than an attempt to “weatherproof” an indoor TV or monitor. TVs and displays purpose-built from the ground up for outdoor use, taking into consideration all weather conditions as well as other abuses, will endure considerably longer. With the potential to short-circuit components and wreck motherboards, moisture is the most obvious enemy of outdoor electronics. And that includes not just rain, but also the intense humidity found in many parts of the country. A specially designed, weatherproof housing is paramount. The smallest gap can allow moisture to seep in, eventually ruining the unit. Look for robust powder-coated aluminum resin cabinets and all-weather gaskets that effectively keep out moisture. Indoor TVs modified and refabricated for outdoor use don’t have the same longevity as those designed for the natural elements. Retrofitted weatherproof housings can’t provide high-quality brightness and will generate internal heat, damaging the unit. Less intimidating but no less of a factor when using a TV outdoors is strong direct sunlight, which can often render a conventional LCD TV un-viewable. But, that’s not a problem now that high-heat tolerant 700-nit screens have overcome isotropic blackout. This is caused when direct, horizontal sunlight overloads the LCD crystals and causes temporary black splotches on the screen. This is not an issue in high-heat tolerant panels and this image consistency means screens are viewable in any light. Temperature extremes, too, are hard on electronics. High temperatures can quickly cause thermal overload in conventional displays, often times leading to permanent damage. Similarly sustained extreme cold can cause the LCD panel to crack. To address these challenges, a multi-fan airflow system present in several models keeps them cool and dry in temperatures up to 122° Fahrenheit and operating safely at temperatures as low as -40° Fahrenheit. This kind of internal heating and cooling isn’t built into indoor screens, and implementing these mechanisms post-production is difficult, expensive and extremely energy inefficient, contributing to higher ongoing operating costs. Wildlife is a factor as well – both human and from the animal world. Those powder-coated aluminum cabinets along with protective front screens form a dependable defense structure. These features greatly lower risk of vandalism, a necessity in many public spaces. As for Mother Nature’s creatures, insects and spiders are attracted to the warm confines of a TV. Spider silk is extremely conductive and spider infestations have been known to cause arcing and electrical shorts inside conventional indoor TVs. Some companies have solved this problem by utilizing special micro-fiber filters on all air vents to seal out insects and spiders. Outdoor displays can even handle challenges brought on by larger animals. The same bulletproof aluminum casings and protective front glass panels that can deter human vandals can also guard against wild animals. In locations where larger animals are a potential problem – in national parks, for example – the screen is all that separates a curious wild animal from the vulnerable electronics inside a TV. The strongest screens can be depended on to resist animal interference. Because the environments for outdoor digital signage vary so widely, it’s wise to work with a supplier that can customize screens for each application. Manufacturing location comes into play here, since far-flung manufacturing and assembly locations make customization, on small or large scales, extremely difficult. Consultation among the client, integrator and the factory is simplified when the manufacturer is based in the U.S. Customization options can include color, dust covers, additional compartments, radio options, wiring components and a wide range of installation options. Naturally, the odds of a job going well are that much greater when working with an integrator with plenty of experience in outdoor installations. 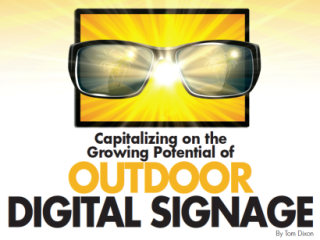 Additionally, it’s more likely that experienced integrators will work with brands well established in outdoor digital signage, and thus be able to meet a wide range of needs and possess a reputation based solely on understanding the unique demands of the outdoor environment. As with many projects, there’s a wide variance in what can be spent on outdoor digital signage. Indoor televisions modified for outdoor use will be the cheapest solutions, but lack of durability and longevity makes this option the least cost-effective in the long run. Outdoor screens designed for residential use aren’t always fully equipped to handle elements like isotropic blackout and strong impacts. These screens may be best suit-suited to environments where customers will be physically separated from the screens and interacting less, or in semi-covered areas where the sun is not as much of a factor. Residential outdoor screens start around $1,495 for a 32” model. More robust, commercial all-weather units increase the price substantially. As an example of what more is available, touch screen technology can be integrated in the same base model (32”) for a total of $4,995. All-weather outdoor digital signage is a product category that was once viewed as a niche market. But today more and more businesses of all kinds are finding that it’s a powerful and cost-effective tool for staying ahead of the competition and better serving customers, whether for advertising, guest services, way-finding, brand experience or other applications. Tom Dixon is vice president of marketing at SunBriteTV.